Hmmmmm... The same age as me...That sounds nice!!! Lovely - I wish I had one of those, too! I kinda liked the growth on the top. Those living "green" roofs are all the rage now. How do you manage to look so stylish while putting in the hard yakka? the best part about getting older is being able to feed all our little obsessions, and not feel like we have to justify it to anyone. Bravo Michelle, I'm sure Mr Vintage and Roma Vintage will become friends for life! Oh..... how delightful! Thankyou for sharing. 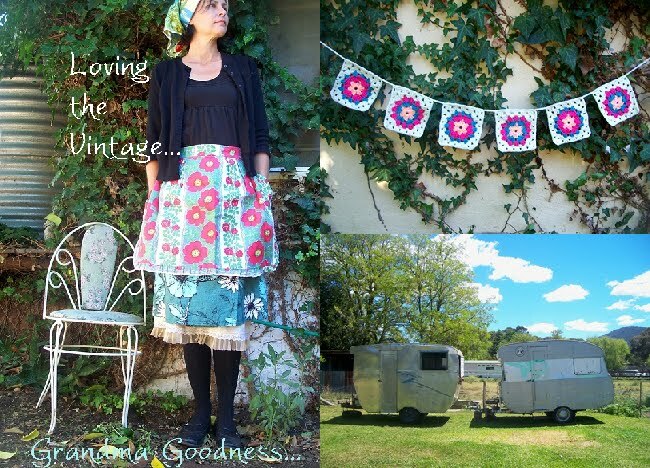 We picked up my grandparents caravan in May this year in perfect nick and just waiting for some serious handmade loving..... not sure whether to go the whole shebang and redo/repaint/theme up or to leave her in her 70's state (immaculate) and accentuate her character with granny chic accoutrements... planning is half the fun! Soooooo cooooooool Michelle! I love her and she's a great addition to your collection!